The second estimate of GDP for the third quarter of 2013, published by the ONS this week, appears to confirm that the UK economy has returned to consistent growth. Yet the detailed breakdown of investment results paints an alarming picture of an unbalanced economy. Growth remains far too dependent on private consumption. 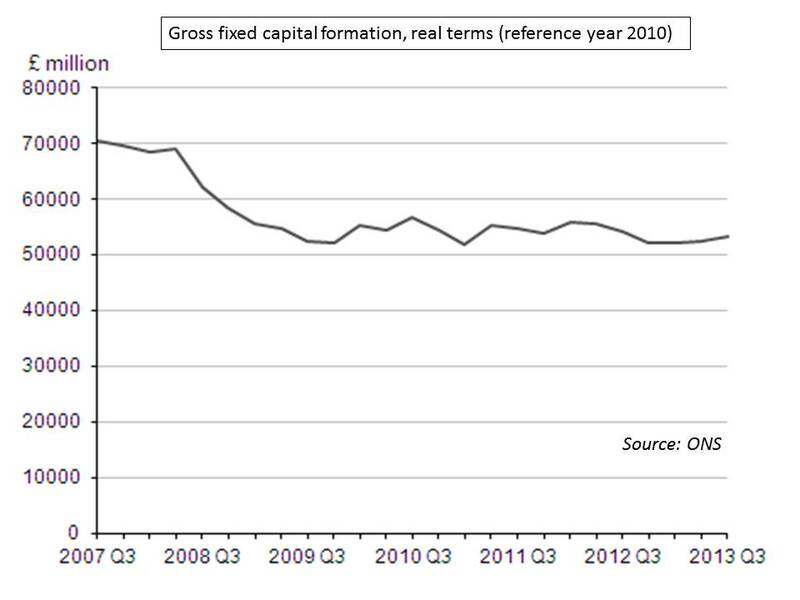 Not only have the constituent elements of growth failed to rebalance in favour of investment, gross fixed capital formation is actually around 25 per cent below its pre-crisis peak in late 2007. It now represents 10.4 per cent of GDP, compared to a G7 average of around 15 per cent. The table below shows that while there has been growth in the previous few quarters, overall investment is largely stagnant and has fallen since the coalition government came to office. The most important source of investment, business investment, showed a slight upturn in the third quarter but has fallen substantially since the beginning of 2012. 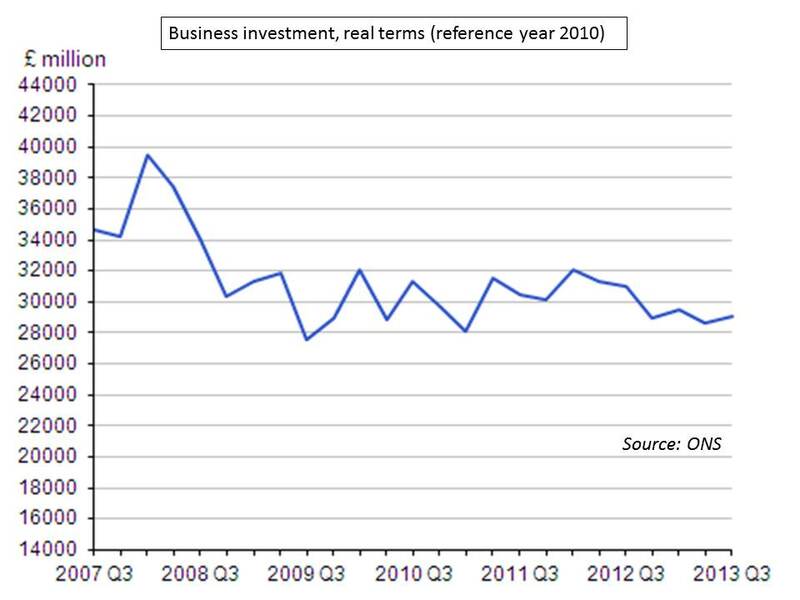 The ONS also break down investment by the type of asset into which investment is made. The most spectacular result is that for investment in transport equipment, which has grown by nearly 2000 per cent in the past year – but from a very small base, and transport-related assets remain a relatively unimportant destination for investment. The more significant result is that investment in dwellings has grown by 7.4 per cent in the past year – while investment in non-residential buildings, machinery and equipment (excluding transport), and intangible fixed assets have all fallen. In contrast, consumption has remained consistently high. It is of course too simplistic to say that changes in levels of consumption represent either good or bad news for the economy. The most important consideration is the proportion of GDP represented by consumption – the high rate evident before the financial crisis proved unsustainable. Yet consumption accounts for roughly the same proportion of GDP as it did when the coalition government came to power, and indeed the same as during the immediate pre-crisis period (that is, around 46-47 per cent). The slowdown in wage growth prior to the financial crisis meant that consumption became dependent on consumer debt. A similar pattern is again evident. Household consumption has grown by around 3 per cent in real terms since the middle of 2009, while real disposable income has been flat over the same period. Earnings have fallen in every month but one since the coalition government came to office. Predictably, therefore, the Bank of England reports that non-credit card unsecured borrowing has increased enormously as the economy has returned to consistent growth, with households taking on more than £5.4 billion in unsecured borrowing between July 2012 and July 2013 – in addition to credit card borrowing returning to levels last evident in early 2011. The return to consumption-led growth has been enabled not solely by unsecured borrowing, but also the housing market – another hallmark of the pre-crisis growth model, and of course also based on debt. Average house prices were largely stagnant from the middle of 2010 to the end of 2012 – but have since grown by around 5 per cent. Moreover, growth has been driven almost exclusively by London. Average house prices in London are now around 20 per cent above their pre-crisis peak (in early 2008), while prices in the rest of the UK are around 5 per cent below the peak. Rising house prices are not necessarily a negative sign for the economy – indeed stagnating house prices in most of the country is a sign that the economy outside London remains in very poor health. But for economic growth to be dependent on consumption fuelled by the housing market is clearly unsustainable. The idea that we are witnessing a ‘pseudo-recovery’, following the failure of economic rebalancing, is explored further in my paper Are we there yet? Growth, rebalancing and the pseudo-recovery, published by SPERI today. There are both political and economic implications of this failure. It seems imperative that the government is held to account for abandoning efforts to rebalance the economy, despite making this objective a cornerstone of the coalition agreement, and subsequent ‘plan for growth’. But irrespective of the party-political blame game, what should worry us most is that, although another financial crisis is unlikely in the foreseeable future, a further crisis in ‘real economy’ seems a distinct possibility if the problems of low pay, under-investment and debt-fuelled consumption once again become entrenched.